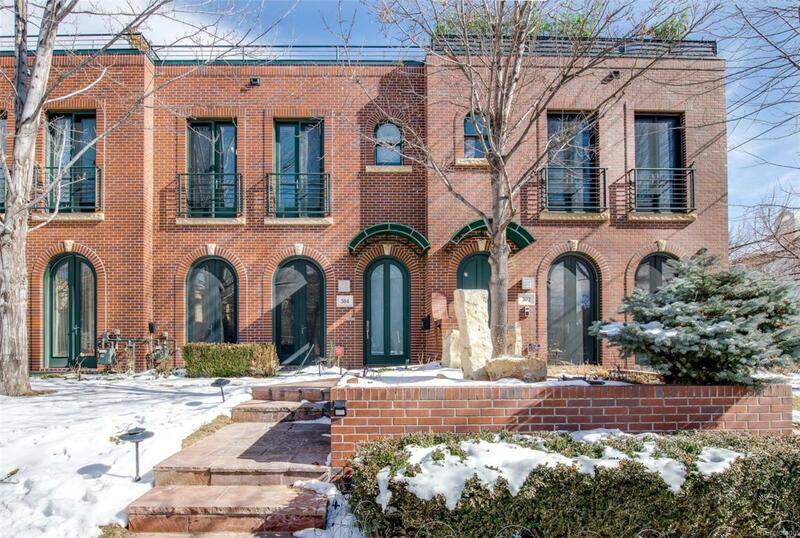 Red Brick, Palladian French Windows + Doors and Juliet Balconies are graciously set back on a prime tree lined block in Cherry Creek North. Stepping into the dramatic living room one is taken back by the unexpected loft-like architecture. Ten foot ceilings, exposed beams, tongue & groove ceilings and an open floor plan engage the senses. Hardwood floors seamlessly unify the entire first floor. An abundance of natural light spills in from 8 french doors. The Kitchen boasts 8 glass french doors that engage to the private courtyard. Upstairs the master bedroom is flanked by 2 sets of 8 glass french doors. The juliet balconies overlook the tree lined street. A gas fireplace adds warmth and ambience. The 5 piece master bathroom has 2 vanities, a jetted soaking tub and steam room. Topping out this abode there is a 3rd floor with 2 decks One has dramatic mountain and Cherry Creek North views. © 2019 Information and Real Estate Services, LLC. IDX information is provided exclusively for consumers' personal, non-commercial use and may not be used for any purpose other than to identify prospective properties consumers may be interested in purchasing. Information is deemed reliable but is not guaranteed accurate by the MLS or 8z Real Estate. Data last updated: 2019-04-24T11:38:06.12.